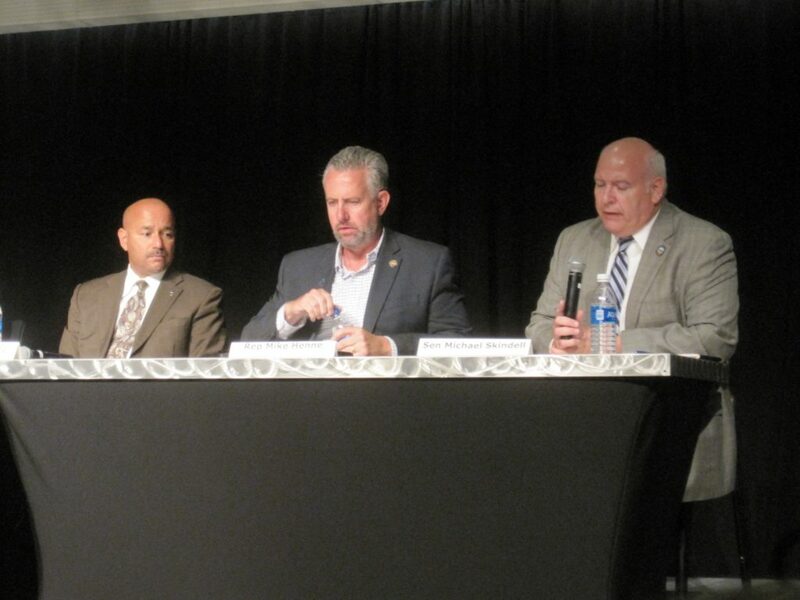 On Wednesday, September 12, state Senator Mike Skindell took part in a panel discussion on the topic “Gun Violence: What are the Options?” The panel, organized by the League of Women Voters and hosted by Case Western, included Dr. Daniel Flannery, Cleveland MHA chief André González, and state Representative Mike Henne. Peter Krouse moderated the discussion. All four panel members agreed on the necessity for further measures to prevent gun violence, including Dayton Republican Rep. Henne, and Skindell who is the Democratic candidate for Ohio House District 13. The panel also agreed that such measures are currently stalled, in Ohio’s General Assembly and in Congress, both of which are controlled by Republican majorities. Skindell noted that he reintroduced legislation earlier this year to let Ohio renew an effective, but lapsed, federal assault weapons ban. He has also signed on in support of other measures including universal background checks, “red flag” laws, bump stock restrictions, and stopping domestic abusers’ access to firearms. Rep. Henne described an approach which he has worked on, combining red flag provisions, outlawing armor-piercing ammunition, requirement that every protective order be run through background check systems, and aligning Ohio with federal regulations on “straw purchases” and the definition of automatic firearms. Skindell said that “with Rep. Henne and I there’s agreement” on supporting the measures Henne has proposed, even though Skindell advocates various additional steps. Despite this, however, even these compromise provisions have made no progress within the General Assembly. “It’s more of an uphill battle than I thought it was going to be,” Henne allowed. Skindell warned that Ohio’s government has been shifting slowly but steadily in the opposite direction. “I have seen legislation moving toward the eventual goal of permitless carry” in all settings, he said. Dr. Flannery began his remarks by saying “the first thing we should do about this issue is vote.” Skindell, recognized as a Gun Sense Candidate by Moms Demand Action, strongly encourages young and old to be engaged this November and in every election to overcome legislators’ inertia on these issues.